Gloria, Anthony J., Anthony C., and Patricia Simboli at the Chair Celebration. The number of asthma cases is on the rise, increasing 28 percent from 2001 to 2011 and affecting more than 25 million people nationwide. Diagnosed in mid-life, Anthony C. Simboli sought effective care for years before meeting a “life-saving find” in Elliot Israel, MD. For the past 21 years, the director of the Asthma Research Center at Brigham and Women’s Hospital has helped Simboli manage his asthma, as well as a barrage of medication side effects. Through medical research, Israel and his colleagues are determined to identify the causes of the complex disease and improve treatment options for patients. 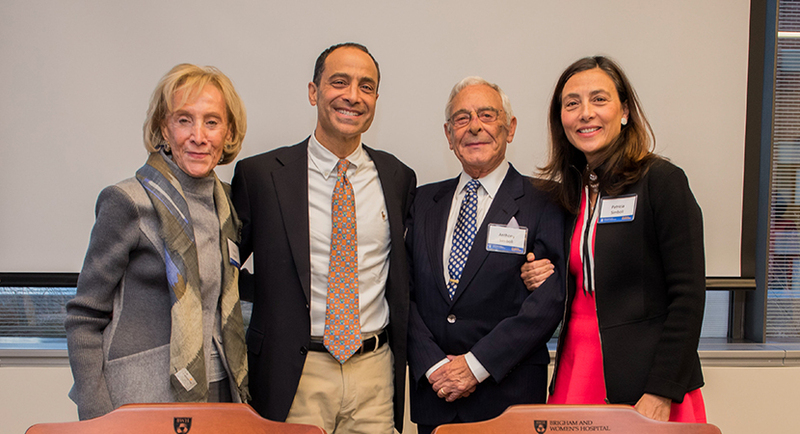 To accelerate this work, Simboli and his wife, Gloria, have made several annual gifts in the past decade to support BWH’s asthma research fellows. Recently, the husband and wife team pledged $2 million to establish the Gloria M. and Anthony C. Simboli Distinguished Chair in Asthma Research. The family also hopes their gift will inspire others to give, with a goal of raising an additional $3 million to establish a new center for asthma research at the hospital. To join the Simbolis in supporting asthma research, contact Terry McGowan at 617-424-4316 or tmcgowan@partners.org.